Even if you forget the traditional toasted pita bread, this simple and flavorful tomato salad still tastes great. Autumn is in the air, and green tomato season has begun. My two most popular posts right now are Got Green Tomatoes? Try My Super Simple, No Sugar, Salsa-Like, Green Tomato Relish Recipe and How To Ripen Green Tomatoes Indoors the Really Easy Way. Gardeners are getting desperate. We had a crisp 38 degrees on the farm Monday morning, but I'm not giving up on more vine-ripened tomatoes just yet. My six late-planted Roma tomato plants started flowering during the extended heat wave that lasted half the summer, so it was too hot for them to set fruit. The blossoms all simply dropped off, but now the sprawling vines are loaded with fat green tomatoes. It's back up in the 80s, and our Missouri Octobers are often mild, so I'm hopeful that at least some of the green tomatoes will soak up the sun and turn red. I need to make more of this salad. I finally stopped making the Greek Style Panzanella with Kalamata Homemade Croutons I've practically lived on this summer, but only because my three enormous volunteer cherry tomato plants quit producing. Now I'm hooked on another tomato salad recipe from Barefoot Contessa How Easy Is That? Fabulous Recipes & Easy Tips. I'm really loving this cookbook. This recipe also calls for tomatoes, cucumbers, and feta cheese in a garlicky olive oil dressing, but it's amazing how just changing a few things—like using scallions instead of purple onions and adding a bunch of chopped fresh herbs—can totally change a dish. Fattoush—also spelled fatoush, fattush, fatush, and fattouche—is basically a Lebanese version of panzanella, making use of stale flatbread rather than rustic loaves. Instead of croutons there are chunks of toasted pita bread or pita chips tossed in the salad, though Ina serves hers on the side. My easy homemade pita bread recipe, which includes instructions for making your own pita chips, only takes an hour, but I didn't have a chance to whip any up before photographing and devouring this batch of salad. And if I wait for more ripe tomatoes and another photo shoot before sharing the recipe, tomato season will probably be over in most places. Traditional or not, the salad still tasted great without the pita. Warning: homemade pita chips are easy to make and hard to stop eating. What originally drew me to this recipe was the combination of fresh parsley, mint, and basil, which are all flourishing in my kitchen garden. I've had a big mint plant patch for years, and am embarrassed to admit that up until now I'd never used the mint for anything except tea. Boy, have I been missing out; these three herbs taste wonderful together. Because the chunks of tomato are so small, a meaty plum (also called paste) variety such as Roma or San Marzano works best here, plus you don't have to worry about seeding them. I've gone crazy for the Japanese Long heirloom cucumbers I've been buying from our Amish neighbors and plan to grow some next year. They have a pleasantly mild flavor, thin skin and tiny seeds, and are amazingly crisp even when over a foot long. This salad doesn't look quite as pretty the next day, but it still tastes really good. I cut the amount of dressing in half and thought it was plenty, but you can always add more. A digital kitchen scale is so handy for weighing ingredients (and postage!). I love my Oxo Good Grips 11-pound scale and often use it several times a day. The pull-out display is awesome. As always, I urge you to seek out local and organic ingredients, as they really do make a difference. Search for local food near you at LocalHarvest.org. Cans of organic garbanzo beans (chickpeas) are one of my favorite bargain pantry staples, and I buy them by the case. As you can see, I haven't quite mastered dicing my feta yet. Makes about 6 cups — Adapted from Barefoot Contessa How Easy Is That? What I love about salads like this is that they don't require any other side dishes. Just serve it alongside some grilled steak or chicken or even burgers and you're all set. Or enjoy a big bowl as a light vegetarian supper or hearty lunch. 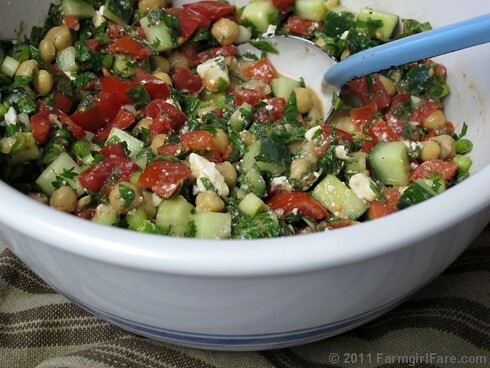 Place the tomatoes, cucumber, scallions, garbanzo beans, parsley, mint, and basil in a large salad bowl and toss to combine. Make the dressing: in a glass measuring cup, use a fork to mix together the olive oil, lemon juice, garlic, 1 teaspoon of salt, and several grinds of pepper. Pour the dressing over the salad, tossing gently to coat all the vegetables. Add the diced feta and toasted pita bread or pita chips (if desired), salt and pepper to taste, and toss gently. If you didn't mix the pita into the salad, serve it on the side. © FarmgirlFare.com, loving the beauty and weather that autumn brings but nowhere near full of those wonderful summer tomatoes yet. Yum! I love fattoush! I order it in middle eastern restaurants and scoop it up with hunks of pit bread. I can't wait to try making it myself! 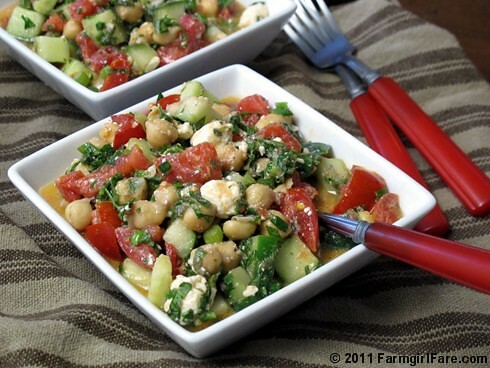 Ohh, fattoush is so good! Thank you (and Ina) for this recipe! Red tomato season is definitely over here in my part of upstate New York. The remaining sad plants--which had the same problem yours did with the heat--got blighted. So! Large bowl of green tomatoes on the counter and green tomato chutney ahoy! I made five pints of it last year and thought we would never eat it all because there's only so much curried lamb I make. Then I discovered my small son LOVES IT on corn tortillas with cheese. So I guess I know what I'll be making every fall until the end of time . . . Question - How do you measure 1/3 cup of chopped herbs (mint, or cilantro, or parsley). I mean how much do you squish them into the 1/3 cup measure. It could make a drastic difference in quantity. Thanks I was just wondering. Thanks for the comments. I think you'll really enjoy this recipe! Ina didn't specify how she measures the 1/3 cup of herbs, but I lightly packed mine - and just amended the recipe above (and the printer friendly version) to include that. I usually weigh fresh herbs, but these were such small amounts I didn't. That's really a neat looking dish. Your version definitely sounds tasty, but you must get some Sumac and see what it adds to the salad. I am completely hooked on it. Wow that is a good looking salad! I think the job of chopping had to be the hubby!